Moscow State University graduates have developed a solar energy ball strong enough to charge laptops and phones. A group of Russian scientists has broken new ground in solar energy production with their design of balloon-like sphere that can power computers, smartphones or, for a short time, a refrigerator, with the energy generated by sunlight. SunEyes, the 1.3 meters (4.2 feet), 5 kilograms (11 pound) ball, is powered by the sun using internal photovoltaic solar energy converters, which are more efficient than conventional solar cells, the company said. Peter Eflov, the project’s creator, became interested in solar energy while studying at Moscow State University. He wanted to supply electricity to remote villages and provide tourists with environmentally friendly energy sources. Moreover, he wanted the new technology not just to enable us to recharge our smart phones, but also to create large power plants. The ball has enough power to charge a couple of laptops or a few phones, and Eflov said they are planning to sell SunEyes to tourists. Eflov and his team assembled the first sample in the summer of 2012. Then developers improved the model after five trial versions. Finally, SunEyes was born. SunEyes developers created special software that allows the device to determine the sun’s position at any time, anywhere in the world. Operating the device is simple: you have to inflate it using the built-in pump, fix the ball using special extensions in a sunny spot (on a picnic lawn or on a roof) and connect a device via USB. The system’s efficiency is estimated to be 30 percent; its power is 200 watts. According to Eflov, one ball is enough to charge 20 tablet computers at a time or to provide a 24-hour supply of power to a refrigerator. For more power, multiple SunEyes balls can be connected to one mini- power station. But a new SunEyes isn’t cheap at 30,000 rubles ($910). However, Eflov is confident that customers will buy these mobile and simple-to-install devices more readily than the flexible solar panels, which cost from 20,000 rubles ($605) to 40,000 rubles ($1,210). "The conventional solar cells made of amorphous silicon, which is flexible and impact-resistant, has an efficiency coefficient of not more than 5 percent or even lower,” Eflov said. 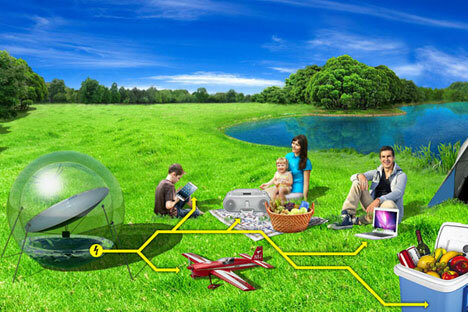 “The solar panel, which occupies the same area as that of our globe will produce two to three times less energy. "Furthermore, SunEyes is more stable in the wind and does not require costly transportation and installation. Currently, the company is accepting online pre-orders and is planning to sell 20 to 100 balls next summer. According to the calculations made by the founder of the project, in Russia’s southern regions the power station will pay for itself in 3.5 years. The total lifespan of each ball is 20 years, meaning the device’s net present value would have increased to nearly 250 percent. Throughout the year, the SunEyes team has been developing the project using its own money. The founders have invested a total of about half a million rubles ($15,150) into the business. In summer 2013, the startup won the "Start" contest run by the Foundation for Assistance for Innovations to Small Enterprises. As a winner, SunEyes will get 1 million rubles ($33,000) by the end of summer 2014. However, the project requires additional funding. Developers plan to attract 3 million to 5 million rubles ($91,000 to 152,000) from a private venture partner in the summer of 2014. According to Eflov, the company has already received an offer from a Singapore-based venture capital fund. The startup needs investment not only to finalize the experimental prototype, but also for building sales. The team expects to negotiate with leisure and tourism retail chains, as well as with suburban goods retailers. SunEyes will also sell power stations through its online store on its website. "The ease of using the SunEyes power stations gives the start up a great chance to make our product popular in the business-to-consumer market," said Mikhail Kharuzin, an employee of the Russian Venture Company. Anton Usachev, the director of the Russian Association of Russian Solar Energy Enterprises, said solar energy as a renewable energy source, has enormous prospects of development in Russia.